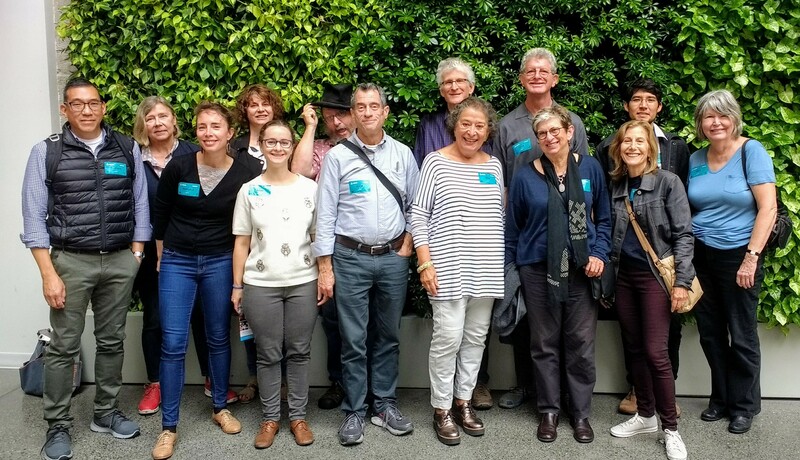 Twenty Ashby Village members and volunteers gathered on a gray August morning in the former Jewelry Mart in San Francisco’s south of Market neighborhood. A green living wall climbs one side of the lofty atrium. Overhead is a cloud-like sculpture made of 16,000 ping pong balls. The building now serves as headquarters of Airbnb, the upstart technology firm that has profoundly impacted the world’s hospitality industry. Manuela Pegoraro, Ashby Village’s Community Engagement Manager, arranged the day’s look inside the facility where over 2,000 employees work. Airbnb links world travelers seeking homey accommodations with hosts who welcome visitors. Overnight stays are available in an apartment in Rio de Janeiro, in a European castle, or on the proverbial air mattress that inspired the firm’s name. Airbnb also offers a range of cultural and recreational experiences from pasta-making in Italy to a visit to a wolf sanctuary north of Seattle. Airbnb employees work at long tables in the bright, airy space or take a laptop to a comfy sofa. Glassed-in conference rooms recreate actual Airbnb-listed properties, including a salon in an Italian villa and a modern apartment in Shanghai. 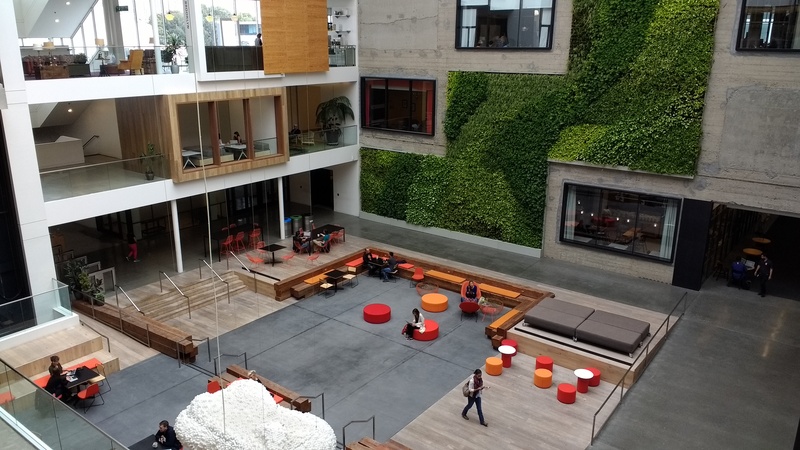 Airbnb employees enjoy complimentary meals from morning to night in the on-site dining room, and dogs are welcome at work. Airbnb partners with nonprofits to make accommodations available to those with special needs. These include refugees from political turmoil and children with life-threatening illness. All Airbnb employees have the option to devote four hours paid time per month to outside volunteer activities. Not surprisingly, the employee demographic appears overwhelmingly youthful. 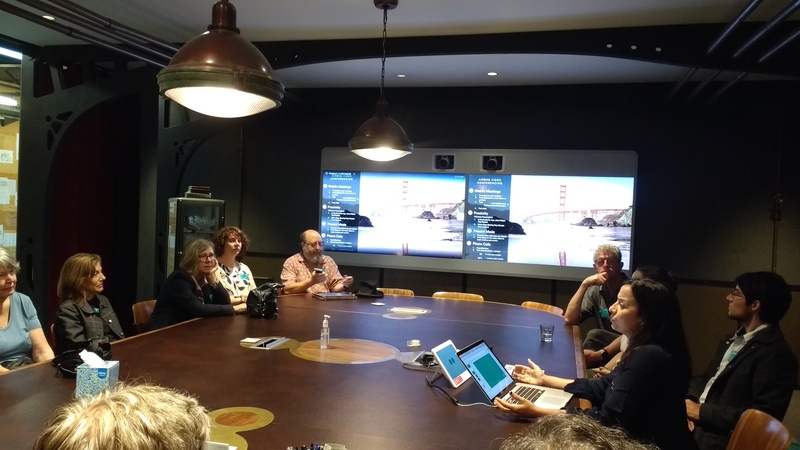 But the day’s tour leaders emphasized that the company’s app and website tools take into account generational differences in approach to electronic technology. After all, Airbnb hosts tend to skew somewhat older than the guests. Most of the Ashby Village volunteers in attendance had previously served as hosts. Ashby Village members, with their breadth of life experiences, undoubtedly include some who could offer an only-in-Berkeley introduction to local culture. Participants in the tour had a very enjoyable time and extend thanks to Ashby Village volunteers Ali and Sara and to Airbnb Social Impact Specialist Laura Ellis and the other Airbnb employees who assisted.